If you’re just getting into camping in an RV, and you’re not sure what type to get, the list of possibilities and floorplans can seem overwhelming. 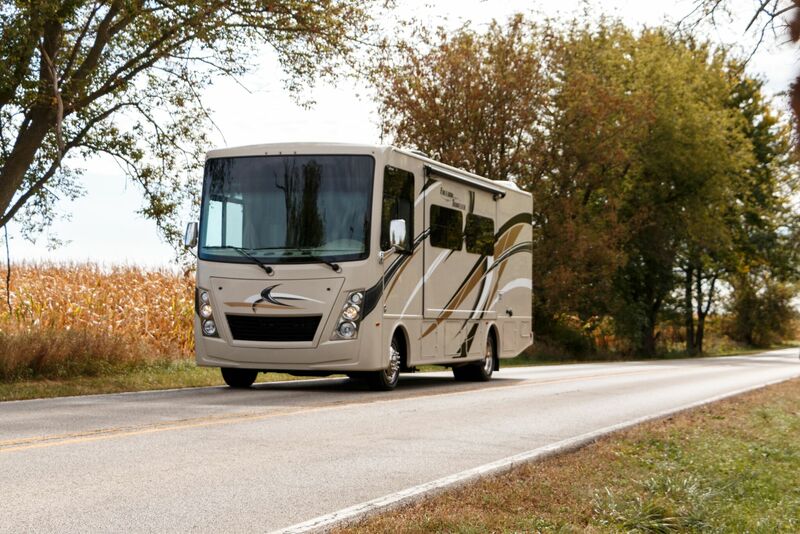 The best place to start is by deciding what type of RV you want to have, a towable one or a motorized one. This distinction might seem like an obvious one, but it can be hard to decide what to get. Your lifestyle, planned use, current possessions and more can all impact your decision, and there are just a lot of things to think about. To help you narrow down your search, I thought it’d be good to take a look at both types of RVs and discuss the pros and cons of each. The motorized RV type—often called a motorhome—is divided up into three distinct classes of RVs. There are the Class A (the largest), the Class C (the second largest), and the Class B (the smallest). Class As are built on bus chassis, Class Cs are built on truck chassis, and Class Bs are built on full-size van chassis. Each one offers unique pros and cons in its own right, but all three offer similar design-based features. Some of these are good, and some not so good. The RV is a single unit, meaning you don’t have two things to take care of. It’s easy to access all of the RV at all times. Ability to move from one campground to the next with minimal setup and takedown. You have the ability to tow a small vehicle behind your motorhome. No need to tow anything if you don’t want to. Any repairs or issues with the vehicle mean you’re stuck without transportation. Poor fuel economy in the large versions. More expensive than a towable RV. Can be more expensive to fix than a towable. Some roads will be out of reach to large motorhomes due to vehicle size. Towable RVs are the alternative to motorhomes, and there are plenty of different kinds of towables out there. 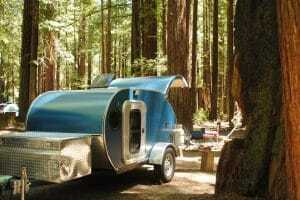 Generally, though, they fall into the following categories: fifth-wheels, travel trailers, and pop ups. The variations don’t end there. There are numerous sub-types out there blending elements from those three main styles. Each towable design out there has its own merits. While no towable is right for everyone, there’s likely an option that would work for you even if you’d prefer a motorhome. Still, towable RVs come with their own downsides. There’s a wider variety of towable options than motorized ones. You’re not stuck driving your RV everywhere. You could get decent gas mileage depending on your tow vehicle and RV. They’re affordable and there are a lot of them. Towables are easier to add to and customize. Often less expensive to repair. When you need repairs, you still have access to your vehicle. Most tow vehicles are big and expensive. 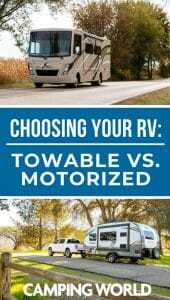 You have to buy a tow vehicle as well as an RV unless you already own one. Campsite setup and takedown times are usually longer than with a motorhome. Towing can be difficult for some drivers to master. 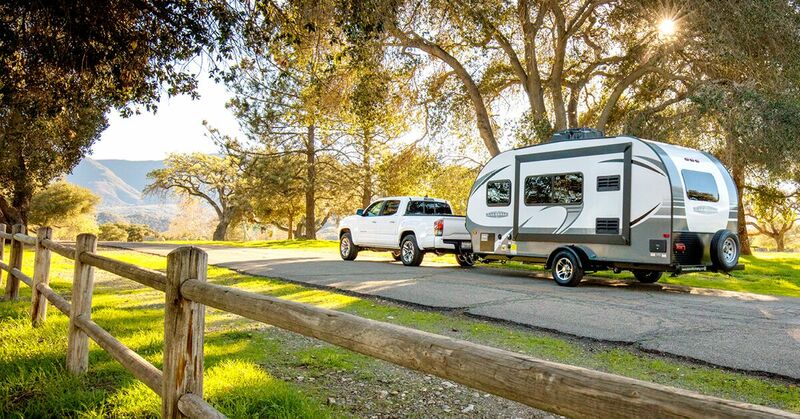 Your tow vehicle and towable RV length may be too long for some campgrounds. The fact of the matter is that there’s no single right answer. Some people love their motorhomes while others couldn’t be comfortable with one. The bottom line is that it comes down to what’s right for you. There is no right or wrong answer here. I personally tend to lean more towards a motorhome, but there have been plenty of times where a towable RV would just make more sense. I find myself looking at lightweight towable options often. You need to really think about how you’re going to use the RV, what you and your family are going to do with it, and generally how you want to live your life while on the road. If you have the answers to those questions, then you should be able to decide which is right for you. Which type of RV is right for you? Why is that the case? Leave a comment below!